Christmas Truce, The Royal Irish Rifles. Winners at a Horse Show, Belgium, 1917. 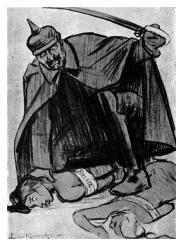 A satirical cartoon depicting German brutalisation of Belgium and Luxembourg. At the first stroke of 11.00 pm, Britain was at war. The British Ambassador in Berlin, where it was midnight, had not received a response to the telegram that he had delivered to the German Foreign Minister at 7.00 pm earlier that evening. The telegram was an ultimatum requiring German assurances with regard to Belgium neutrality and no reply by midnight Berlin time meant that a state of war existed from 11.00 pm London time. The Admiralty immediately flashed a war telegram to fleets and establishments across the world to ‘commence hostilities against Germany’. The 1st Battalion The Royal Inniskilling Fusiliers was in India and sailed for England, arriving in January 1915. The 2nd Battalion was in Dover. The 3rd and 4th (Reserve) Battalions in Omagh and Enniskillen mobilised and moved to Lough Swilly, County Donegal. The 2nd Battalion The Royal Irish Rifles was in Tidworth, England and received its orders for mobilisation at 1800 hours on that day; by 9th August 1914, the battalion, having received a draft of 224 men three days earlier, was ready for its move with the British Expeditionary Force to France. Meanwhile the Reserve Battalions, the 3rd (Antrim), 4th (Royal North Down) and the 5th (Royal South Down) also mobilised. The 4th Battalion, having concentrated at Newtownards, moved to Palace Barracks Holywood and then provided detachments for coastal defence duties at Bangor, Donaghadee, Belfast and Grey Point Battery. The 3rd Battalion moved to Dublin and the 5th Battalion to Victoria Barracks, Belfast. The 1st Battalion was at this time the Foreign Service battalion and was stationed in Aden where it spent the first two months of the war preparing the colony's defences. The 1st Battalion The Royal Irish Fusiliers was in Shorncliffe, England and entrained for York on 8 August. The 2nd Battalion was in Quetta, India (now Pakistan) but sailed for England in October and arrived on 20 November, then moved to camp at Winchester. The 3rd and 4th (Reserve) Battalions were mobilized in August and moved respectively from Armagh and Cavan to Lough Swilly and Belfast. The 1/18th (County of London) Battalion (London Irish Rifles) at the Duke of York's Headquarters, Chelsea was part of 5 London Brigade, 2nd London Division. The Battalion mobilized and moved to St Albans. A second Territorial Force battalion, the 2/18th (County of London) Battalion (London Irish Rifles) was raised later in August 1914.